Sellers are still in control of the price action this fall. No two ways about it, it's been an awful year for shareholders of General Electric (GE - Get Report) . Since this time last year, shares of the blue-chip conglomerate have shed about half of their market value, losing their place in the vaunted Dow Jones Industrial Average after more than a century. Despite GE's recent missteps, it's still one of the largest companies in the world. And the extent of the selling has also been catching the attention of value investors looking for a buying opportunity in a beaten-down stock at the same time valuations look frothy elsewhere in this market. But it's wise to resist the temptation to buy GE - it least for now. From a technical standpoint, sellers remain distinctly in control of shares. To figure out what it would take for that to change, we're turning to the charts for a technical look. We'll start off in the short-term. You don't need to be an expert technical trader to figure out what's going on in shares of GE right now. Instead, the price action is about as straightforward as it gets. Shares of GE have been in a well-defined downtrend since the start of the summer, selling off of every test of the top of their price range. Put simply, it makes sense to steer clear of shares until they can manage to catch a bid above their upper trendline, currently right around the $13 level. Likewise, relative strength, the indicator down at the bottom of GE's chart, has been in a downtrend of its own in 2018, indicating that shares have been systematically underperforming the rest of the broad market all year long. Statistically speaking, underperformance tends to beget even more underperformance, a fact that we've seen play out in recent months. Even in the longer-term GE's technical picture continues to look rough. Make Money on Closed-End Mutual Funds.TheStreet's Robert Powell hosts an all-star panel of experts who explain everything you need to know on closed-end mutual funds, an often-overlooked investment class. Click here to register and watch for free. 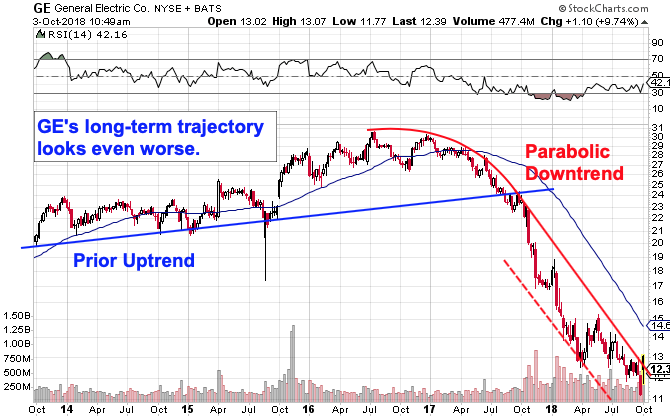 While shares had been in an uptrend heading into 2017, that uptrend reversed by July of last year, sending GE into a parabolic downtrend that shares have yet to climb back out of. For longer-term investors, the 50-week moving average has been acting like a reasonable proxy for that downtrend, making it a logical place to wait for GE to trade above before thinking about getting long this stock. Bear in mind that there's a big difference between a stock and a company. 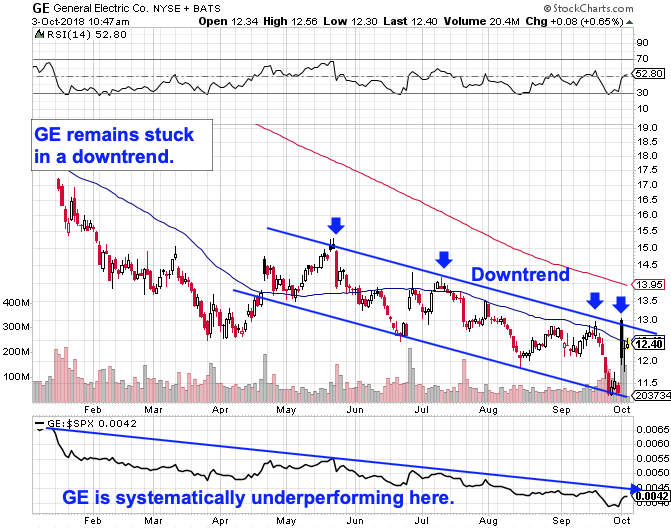 GE's weak price action is likely to persist beyond the point where it becomes attractive fundamentally. For that reason, it makes sense to steer clear of shares until they can trade out of their short- and long-term downtrends. We're not there yet.